Here’s a quick roundup of the Black Friday / Cyber Monday deals that I felt either had broad appeal, were finance-related, or might ideally save you money on stuff you would have bought anyway. Amazon 10% Off. A reminder to save on their Cyber Week deals and everything else on Amazon with Chase Freedom 10% back, Discover Card (5% or 10% back with Double It Promotion), and AmEx Offers $15 off $60. I shop there a lot and have already loaded up on gift cards to lock in the savings. Kindle eBook Deals. One day sale on popular Kindle books, up to 40% off their Kindle Unlimited eBook subscription service. Target 15% Off. Target.com is offering 15% site-wide on 11/30 with promo code CYBER15. Useful for things that are usually not discounted. Stack with 5% off with their REDcard. Travelocity 17% Off. Get an additional 17% off any hotel booking of $300+ on Cyber Monday, on top of the normal discount. Also get $150 off $1,500+ airfare and hotel combo booking. Expedia $75 off $300. $75 off your first hotel booked on the Expedia App ($300 minimum purchase). 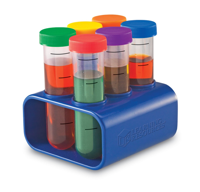 Stack with their already-discounted rates for Cyber Monday. Hotel stay must be by March 31, 2016. SimpliSafe 20% Off. DIY Home Security system. See my Simplisafe Review. 20% off during Black Friday weekend, which probably the biggest flat discount I’ve seen. Quicken 2016 40% Off. Get 40% off the list price of 2016 Quicken Deluxe, Premier, Home & Business, Rental Property Manager, or Quicken for Mac 2016. Valid either at Amazon or Quicken.com. This is one of the biggest discounts you’ll see. Thanks to reader Brad for the tip. iBank for Mac 20% Off. Alternative money management software for Mac. 20% off through 11/30. Ting Black Friday Deals. Possibly cheaper cell phone service for some folks. Buy a device or bring your own. See my Ting post for details. Good until 11/30 at 11:59 ET. Obi200 Free Home Phone Service $29.99. Helps you use Google Voice to get free home phone service using your existing internet connection. 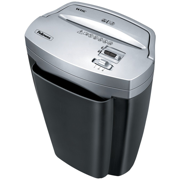 See this Obihai and Google Voice installation post for details. Valid at both Newegg and Amazon. I’ve just finished reading new book Charlie Munger: The Complete Investor by Tren Griffin. For the unaware, you can read the Wikipedia for Charles T. Munger, otherwise probably best know as the Vice Chairman of Berkshire Hathaway and partner of Warren Buffett. 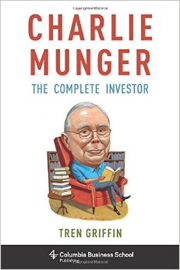 The book is meant to corral all the various sources of Munger teachings into a “unified theory” of investing. As is my practice, here are my favorite highlights of the book followed by a quick review. I will try to clearly separate what are Munger quotes and Griffin book excerpts. The point is not to treat anyone like a hero, but rather to consider whether Munger, like his idol Benjamin Franklin, may have qualities, attributes, systems, or approaches to life that we may want to emulate, even in part. This same process explains why Munger has read hundreds of biographies. Learning from the success and failure of others is the fastest way to get smarter and wiser without a lot of pain. Successful Graham value investors spend most of their time reading and thinking, waiting for significant folly to inevitably raise its head. Although Graham value investors are bullish about the market in the long term, they do not making investing decisions based on short-term predictions about stocks or markets. Zero. This is the third time Warren and I have seen our holdings in Berkshire Hathaway go down, top tick to bottom tick, by 50%. I think it’s in the nature of long term shareholding of the normal vicissitudes, of worldly outcomes, of markets that the long-term holder has his quoted value of his stocks go down by say 50%. In fact you can argue that if you’re not willing to react with equanimity to a market price decline of 50% two or three times a century you’re not fit to be a common shareholder and you deserve the mediocre result you’re going to get compared to the people who do have the temperament, who can be more philosophical about these market fluctuations. For most professional money managers, if you’ve got four children to put through college and you’re earning $400,000 or $1 million or whatever, the last thing in the world you would want to be worried about is having gumption. You care about survival, and the way you survive is just not doing anything that might make you stand out. The idea of caring that someone is making money faster [than you] is one of the deadly sins. Envy is a really stupid sin because it’s the only one you could never possibly have any fun at. There’s a lot of pain and no fun. Why would you want to get on the trolley? His timeless advice is to avoid situations with a massive downside and a small upside (negative optionality). Why play dice with something that can ruin your life forever? Commentary. This book was a solid, short introduction to the world of Charlie Munger from an investing point of view. It has a ton of Munger quotes, but Griffin also does a solid job weaving in quotes from other famous investors like Warren Buffett and Seth Klarman. If you are a fan of Warren Buffett, you will like this book. Of course, what makes Munger special to me is that he talks about stuff beyond investing, like ethics and morality. For example, I liked that he points out the lifetime benefits of simply “being reliable”. So many workers are just not reliable. Therefore, for a more complete picture, I recommend reading Poor Charlie’s Almanack, which includes transcripts of all his talks, lectures, and public commentary. Reasons for why it is not more popular include the length (really long) and the cost ($50+). After reading and digesting it all, I feel it was fifty bucks well spent. However, if you choose to skip the Almanack, I’d say you’d get $15 of value out of this book. 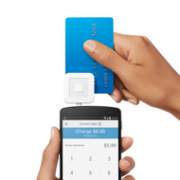 As you’ve probably heard, the Square IPO was completed last week. For a while, I didn’t understand how a company could have a $4 billion valuation when they basically offer a simplified merchant account. They let small businesses accept credit cards, which means they skim a tiny bit off the 2.75% they charge while most of it goes straight to the networks. (Add in their other expenses, and Square has never made a profit.) Wouldn’t you rather own Visa or American Express directly? Paypal said it has doled out $500 million in loans in the first year-and-a-half since it introduced the lending program. And rival Square recently said it had extended more than $100 million in cash advances in the year since it started its own version. […] PayPal, like Square, deducts money from merchants’ accounts based on their receipts, so that they aren’t on the hook if business slows. At both PayPal and Square, payments are taken as a portion of transaction volume, meaning merchants repay more when sales are high and don’t pay on days without sales. That allows for easier repayments, but makes it difficult to calculate an annual interest rate. Wow. Ingenious or evil genius? It would be like lending to everyday people but being able to intercept their paychecks before they even landed in their bank accounts. You’d get the money before people could even have the chance to default (or pay for food). Some banks already have something called “direct deposit loans” allow them direct access to bank accounts, taking payments almost immediately after your paycheck arrives. It is possible for motivated people to switch off their direct deposit or move banks, but you’re giving the lenders a built-in advantage. So what’s my point? For one, Square may have a growing profit source from these first-in-line loans to small businesses. Second, as a smart consumer, you should be careful to stay in control of your cashflow. I’d never give a lender permission to withdraw money at any time from my bank account. They should have to wait for me to pay them. Free electronic fund transfers to a linked checking account. 24/7 online and mobile access, or talk to a real person 7 days a week 8AM-8PM. To qualify for a bonus, your account must be funded within the first 10 days of account opening. Deposits from an existing Capital One 360 account will not qualify for the bonus. The amount of your bonus will be determined based on the highest amount you deposit within the first 10 days of account opening and maintaining that balance on a daily basis for the next 90 days following the 10 day period. You must deposit a minimum of $5,000 and maintain a daily balance of $5,000 for 90 days after the initial 10 day period to qualify for any bonus. The amount of the bonus you actually earn will be determined based on the following balance tiers during the initial 10 day period and the 90 day period after that: $5,000+ earns a $50 bonus, $10,000+ earns a $100 bonus; $20,000+ earns a $200 bonus; $30,000+ earns a $300 bonus; $40,000+ earns a $400 bonus; and $50,000+ or more earns a $500 bonus. The maximum bonus you can earn is $500. Essentially, if you deposit an amount exactly on the tier level, you will earn 1% of your deposit (i.e. $50 on $5,000 or $500 on $50,000) with a minimum holding period of 90 days following the 10-day deposit window. This is in addition to the existing interest rate. For more details on the account interface and such, please check out my 360 Savings account review. Disclosure: I will receive a referral if you open an account via one of the links above, as a paid endorsement. To my knowledge, this is also the best publicly-available 360 Savings bonus offer out there. I won’t be participating myself because I’ve had an account (ING Direct) since 2005. Please refer to my full advertising disclosure. Here’s some free stuff for existing Verizon Wireless customers. Visit vzw.com/thanksgetting and Verizon will give you 1 GB of free data this billing cycle, and another 1 GB your next billing cycle. Starting on Wednesday 11/25, they’ll start giving out other stuff like $5 iTunes gift cards, free Amazon media credits, and free in-flight WiFi. The bonus data should show up in your online account almost immediately after enrollment. *Limit one data promotional per account. The 1GB Data offer (“Promotional Data”) can only be redeemed one time per account by VZW customers on a qualifying plan. Must have a valid VZW Mobile Telephone Number. Promotional Data will be added to your existing monthly data allowance, and applies to data usage after Promotional Data redemption date. Promotional Data will be shared by all lines on an account. Data usage applies for app downloads/use. Added separate free data offer: I’m still waiting to verify for myself, but Verizon is giving away 2 GB of data per month for 3 months to those people who download their Go90 app according to this link (log in and scroll down to see offer). Promo offer only applicable to The More Everything Plan and The Verizon Plan customers with accounts in good standing. Extra data applied to account and is for any data usage. One promotional offer per account. This promotional data can be combined with other Verizon promotional offers. Limited time offer. 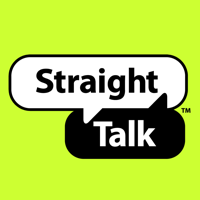 Straight Talk is a prepaid MVNO that offers the ability to buy SIM cards that you can pop into any AT&T-compatible, T-Mobile-compatible, or unlocked GSM phone. This includes many Samsung Galaxys and iPhones that you can buy refurbished or on the used market. For $45 a month you get unlimited minutes, unlimited text, and 5 GB of high-speed data with no contracts and no credit checks. You also avoid the usual cell phone taxes that can add $5 to $10 per line. Unlimited data means 3G/4G data speeds for 5 GB per month (recently improved from 2.5 GB) and then 2G data speeds after that. 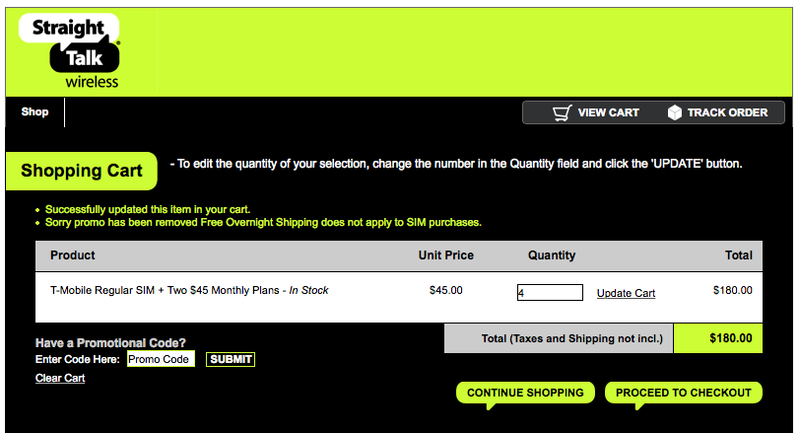 $45 a month is the everyday price. Last year, there was a nice promo that let you buy 4 months of the Straight Talk unlimited plan for $26 a month, a significant 42% savings off the regular price. I’m actually just updating that old post here and pruning stale comments. Each package includes 2 monthly plan cards, and you can buy 4 packages for a total of 8 months for $180 + taxes and shipping where applicable. 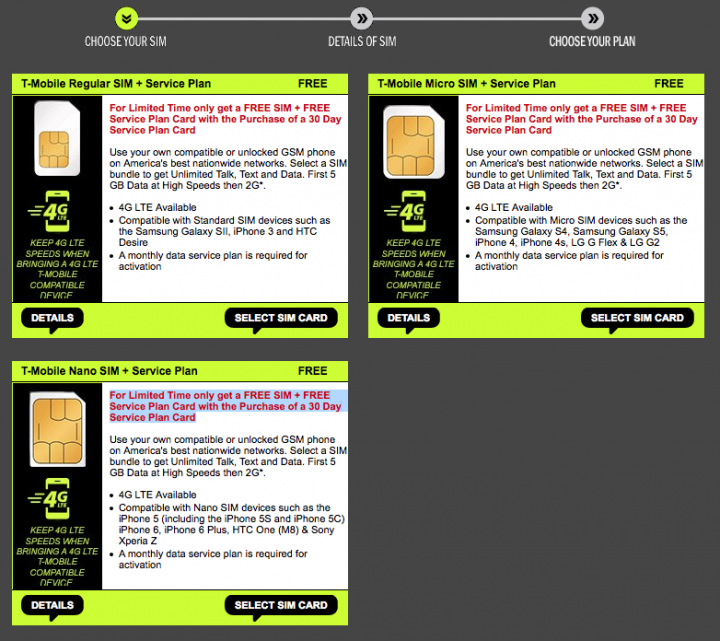 While the link only let you buy a T-Mobile SIM card as part of the package, the actual monthly plan cards can be activated with any provider SIM. They also sell AT&T SIM cards on the same website, if you prefer that. You can also try to stack with cashback shopping portal. For example, BeFrugal.com normally offers $30 cashback for airtime + SIM purchase. BeFrugal also has $10 bonus for new customers that earn $25 in cashback. See reader Shoe’s comment. If your desired SIM size is sold out, know that you can buy a simple $4 SIM cutter which can cut any SIM card into a micro SIM or nano SIM. (Or a $4 SIM adapter will make a nano into micro or regular SIM.) 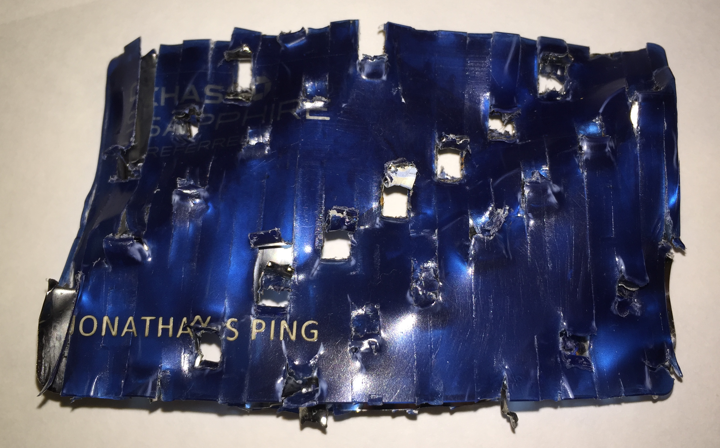 You may have to use a bit of sandpaper as well for the nano SIM as they are a little thinner than regular SIMs. Read the reviews, they work. You can also check back later to see if they restock, but I’d rather just lock in the savings with whatever SIM is in stock. Finally, the $60 international cards are also buy 1 get 1 free, making them $30 and still cheaper than the $45 plan. The $60 plan has the features of the $45 plan unlimited calling to Mobile in Mexico, China, India and Canada and some other features. So it’s still a pretty good discount (33% off) if the rest are out of stock. Added bonus for new sign-ups. 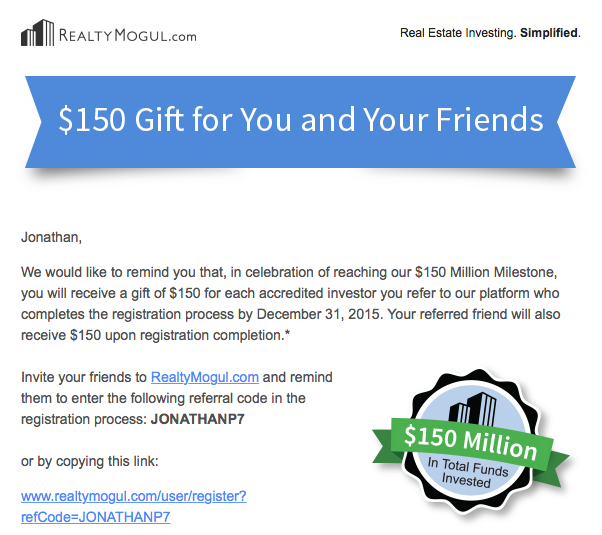 I’ve been a registered member of RealtyMogul for a while, and they recently emailed me that if I referred a friend, we’d both get a $150 Amazon gift card just for completing the registration process (i.e. zero investment required). Here is a screenshot. The restriction is that you must be an accredited investor, which means either a single income of $200,000, joint income of $300,000, or net worth of $1 million excluding primary residence. I’ve registered at a few of these sites, and you may need to send in a scanned W-2 (was allowed to remove SSN) or brokerage statements for verification. This is a nice carrot if you are already interested in hard money lending or fractional real estate ownership. You must either use this special sign-up link or use the promo code JONATHANP7 during registration. Offer expires 12/31/15. *The referrer and the referred will each receive a $150 gift card (redeemable at Amazon.com) upon successful completion of the investor registration process at RealtyMogul.com by the referred party. Gift cards will be mailed within 30 business days to the address on file. This promotion is limited to 6 referrals per referral code and is only valid until December 31, 2015. Taking an equity ownership position means that you own a little slice of a single-family home or multi-unit complex while a professional does the buying, fixing up, renting out, and eventual selling. Realty Mogul only has done one deal like this so far (fully funded) and the intended timeframe is 5-7 years. You earn rent while the house hopefully appreciates in value, and cash out when the house sells. Being a lender looks very similar to the age-old practice of hard money lending, just with smaller chunks. You lend the money to a house flipper who needs a short-term loan (3 months to a year) and doesn’t want to deal with traditional mortgage lenders and their closing costs and long underwriting delays. The loan is backed by a personal guarantee (not too special, you can try to sue and/or hurt their credit score) and more importantly you usually have a first position lien on the property (if they don’t pay, the lender gets the title to the house). Most of the previously funded loans have an annualized interest rate of 8%. Realty Mogul states that they differentiate themselves from other similar startups like FundRise and Prodigy Network by (1) outsourcing the real estate expertise to vetted professionals and (2) keeping a focus on cashflow, either via rent or interest payments. 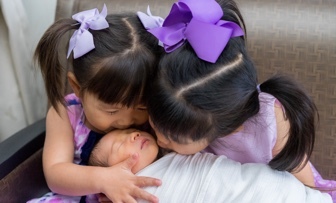 Right now they’ve only had about 7 investments, but they seem to open a new one up after the last one fully funds. Currently, the SEC limits this type of investment to accredited investors, which means either a single income of $200,000, joint income of $300,000, or net worth of $1 million excluding primary residence. When I tried the application, the only screening process was to check a few boxes and state that you qualify. Supposedly, the recently passed JOBS Act will allow them to drop this requirement later this year. If given the option, should I drop $5,000 into this to try it out just like with person-to-person lending? $5,000 is still a lot of money to put into an investment where you are not able to do much due diligence. 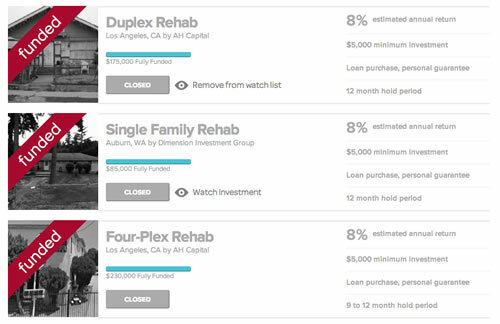 Getting good returns on a single investment project is all about the skill of that particular rehab team. Will the teams that sign up for capital via Realty Mogul always be the good ones, or those that are having a hard time getting funding from elsewhere? I thought that hard money lending rates were more in the 10%+ range; I don’t know if I’d be happy with 8% but maybe that’s the going rate now. Even if you have collateral, recouping your principal in case of a bad loan can get complicated and time-consuming. At least with P2P lending I can spread $5k over 200 different loans such that even though I am certain to get some defaults, it is unlikely I will get a negative return overall. There is a constant search for the elusive “new” asset class that offers high returns but with low correlation to stocks. In Skating Where the Puck Was: The Correlation Game in a Flat World, William Bernstein points out that soon after one is “discovered”, the future returns and correlations will quickly change as to be useless. Past examples have included commodities futures and international REITs. See a trend? Investment-grade government-backed, corporate, and municipal bonds. 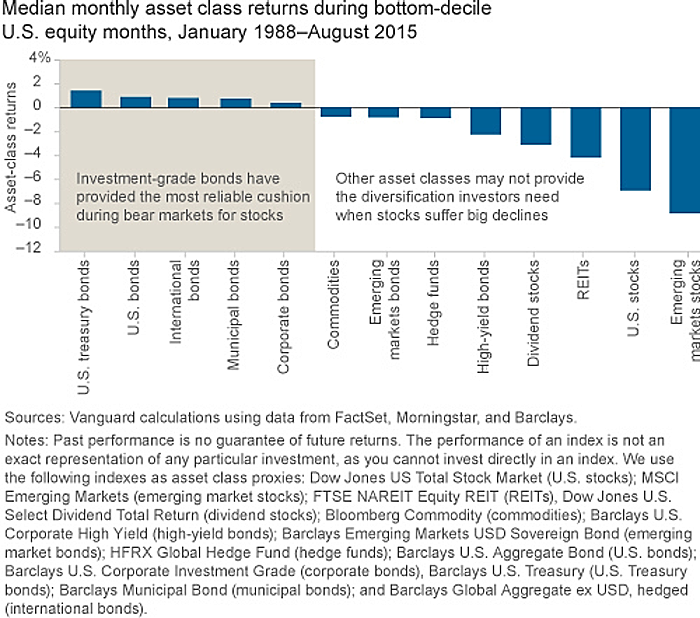 While their long-term returns aren’t going to be as high as stocks, high-quality bonds remain the best asset class for diversifying against stock market price drops. You can compare these results to Bernstein’s guide to picking bonds. Sure, interest rates will rise eventually. But we don’t know how much they will go up (could be very little), how fast (could be very slowly), or if they will stay higher (could drop down again). As long as you have high-quality and short/intermediate maturity lengths, bonds will keep on doing their job as the ballast in your portfolio. 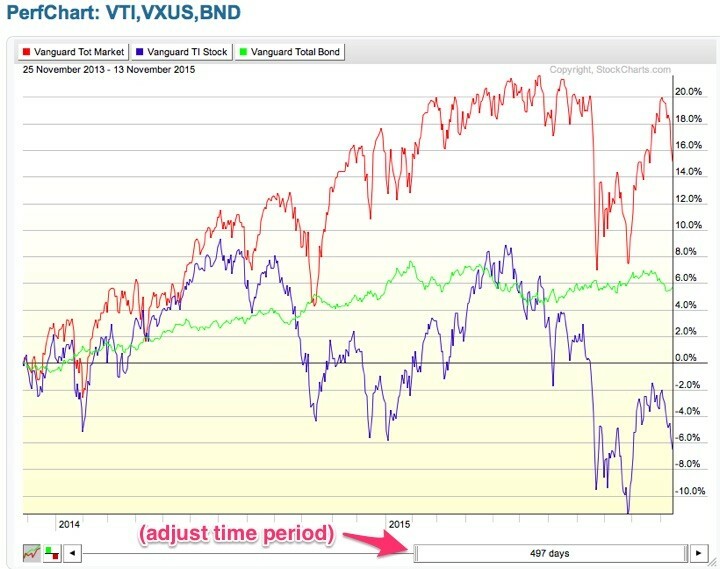 Check out the wiggly lines in this StockCharts.com interactive chart comparing the historical performance of ETFs tracking US stocks (VTI), international stocks (VXUS), and high-quality bonds (BND). Adjust the bottom time bar to adjust the lookback period. People will vary in how much bonds to have in their portfolios, but I like the idea of always having at least a little “slow and steady” stuff in my portfolio. There used to be a series of ING commercials where people would carry around their “Number”, which was usually over a million dollars. I think such large numbers actually discourage most savers, so what if we had an alternative goal that was both more achievable yet realistic? Most people will never achieve $100k in portfolio assets. Forget a million bucks. 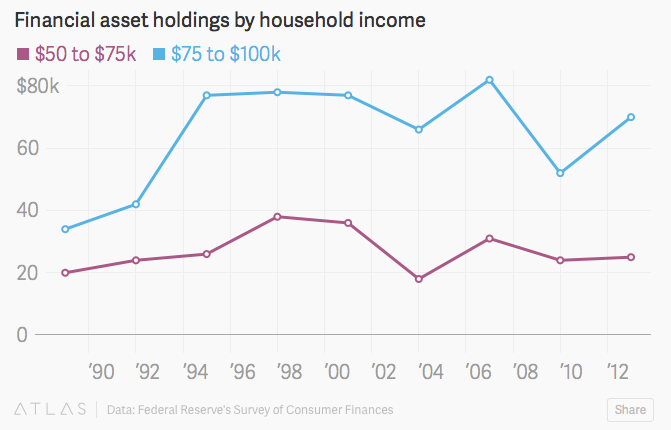 Consider this chart from the Quartz article America is full of high-earning poor people. On average, even a person earning close to six figures will struggle to reach $100k in financial assets by age 55. The figure below plots financial assets held by the upper middle class (household income from $50,000 to $75,000, and $75,000 to $100,000) aged 40 to 55. Financial assets are any assets a household owns that isn’t a house, car, or business, which means it includes all retirement funds. If you reach $100k quickly, that means you have high earning power. Let’s say you start a successful small business or are in a well-paid professional field. Well, you have the saving potential to reach the millionaire level, you just have to keep it by not increasing your spending accordingly. If you reach $100k gradually, that means you have built up a strong habit of spending less than you earn. Let’s say it takes you a decade of steady saving to reach $100k. That’s okay, as you’ve shown that have both consistent earning power and spending restraint. You’ll be able to save another $100k over the next decade for sure, meanwhile your first $100k is going to keep on growing. At the $100,000 level, compound interest become significant. At 5% return, your $100,000 will grow by $5,000 in just one year. That’s $5,000 for doing nothing but waiting around for a year. The year after that, you won’t just have another $5,000. You’ll have $5,250 due to compound interest. At the end of five years, that $100k is already $127,628. Add in the additional money from your continuing habit of saving, and things start to improve quickly. Your snowball is growing. I no longer automatically reinvest my dividends from my taxable mutual fund and ETF holdings because I love seeing the money show up in my cash account. A few clicks and I’ll reinvest them, but I like the feeling of “cashing my dividend checks” and knowing that one day I’ll be waiting for them to arrive instead of my paycheck. Now, I still think savings rate is a better measuring stick than portfolio size, because someone who can earn $60k and spend $30k every year is going to be able to retire much sooner than someone who earns $180k and is stuck in a lifestyle spending $150k. But if you are in the phase of your life where you love watching your account balances grow every day, even by a few dollars (been there, done that), $100k is the biggest goal you need. Related: Munger: Work For Yourself An Hour Each Day and Munger on Parenting and Childhood. It’s back! Wow, haven’t posted a Groupon deal in a while. I really should have shorted the stock when even I unsubscribed from their daily newsletter, but I didn’t have the guts. Now I’m just mad because they deleted my account after not using it for a while, even though I still had unused credit (and I’ll have to open a new one for this deal). Anyway! Groupon is selling a $15 Starbucks Gift Card for $10. Limited quantities, ends in a week or so otherwise . Why is free coffee so appealing? Over 100,000 sold already. Limit 1 per person. TopCashBack ($10 bonus after $10 earned in cashback rewards, expires 11/16). There was previous promo with the Chase Sapphire Preferred card, but now there is a another separate promo with the Chase Freedom. Earn a $15 statement credit after you spend $15 or more with your Chase Freedom® card using Visa Checkout. Valid for new or existing Visa Checkout accountholders. Read on, it’s an easy $15 if you have this card. More people out there probably have the Chase Freedom card. No annual fee and 5% cash back in rotating categories every quarter. Visa Checkout is a way to pay for things online without have to give a merchant your credit card number. You use a login and password instead. Think Paypal, but Visa-branded. Participating merchants include Pizzahut.com, Shutterfly, Newegg, Staples, Fandango, Orbitz, Gap, and more. Order a pizza from PizzaHut.com. You must get it delivered, not carry out. I can usually get 2 pizzas for around $20, so a $15 credit would cover most of dinner that day. Buy some movie tickets from Fandango. Go to NewEgg.com and buy a $15 to $20 gift card to a place you like. This offer is valid from 11/2/2015 through 12/31/2015. To qualify for this offer, you must make a single purchase of $15 or more using your Chase Freedom Visa credit card with your Visa Checkout account during checkout. Limit (1) $15 statement credit per customer or card account. Allow 1 to 2 billing cycles from Visa Checkout purchase for delivery of the statement credit to the Chase Freedom account added to the Visa Checkout account; your card account must remain open and not be in default to receive the statement credit.